The Kalamazoo Valley Museum planetarium will be changing shows this weekend, starting tonight (Friday) with the Led Zeppelin show starting at 8:00 PM. Tomorrow (Saturday) the Mystery of the Missing Moon will run at 1:00 PM, Orion Nights will run at 2:00 PM, and Stars of the Pharaohs will run at 3:00 PM. 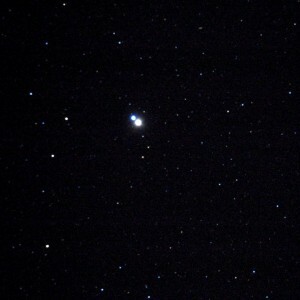 On the night of August 14th a nova or “new star” appeared at the edge of the constellation Delphinus. The star brightened enough to be visible to unaided eyes for a few days, but has since faded so that now binoculars or a small telescope are required to see it. The star is estimated to be 13,000 light years away from our solar system. In the image above, the diamond shape it the top of Delphinus, and the arrow is the constellation Sagitta. Both are found near the bright star Altair in the summer triangle. 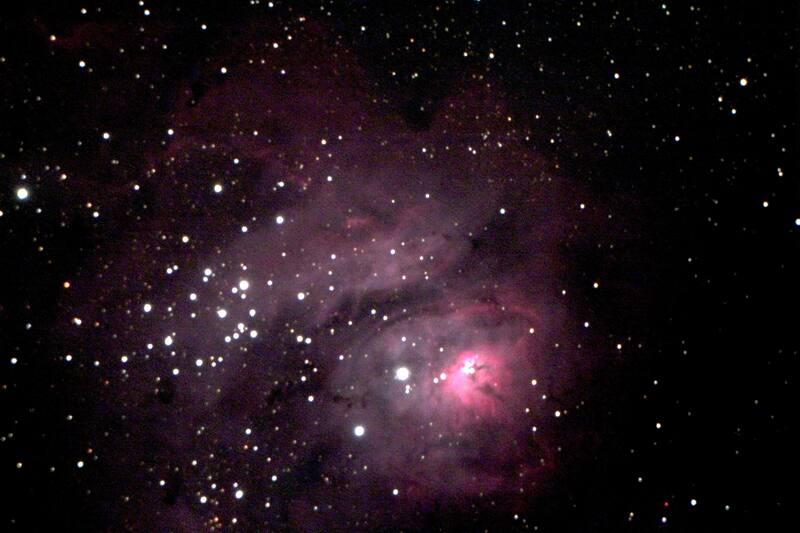 One of the highlights of the summer sky is a cloud of gas called the Lagoon Nebula. It is barely visible to the unaided eye, but easily seen with a pair of binoculars. The pink color is due to the presence of hydrogen gas, excited by hot stars within the cloud. There is also a little blue coloring mixed in where starlight is reflected by embedded dust. A dark dust band divides the cloud in two parts. 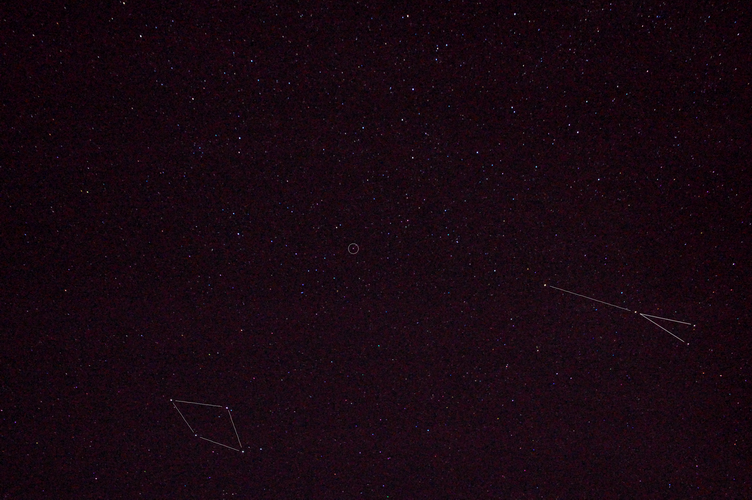 The star cluster NGC 6530 is visible at the left. 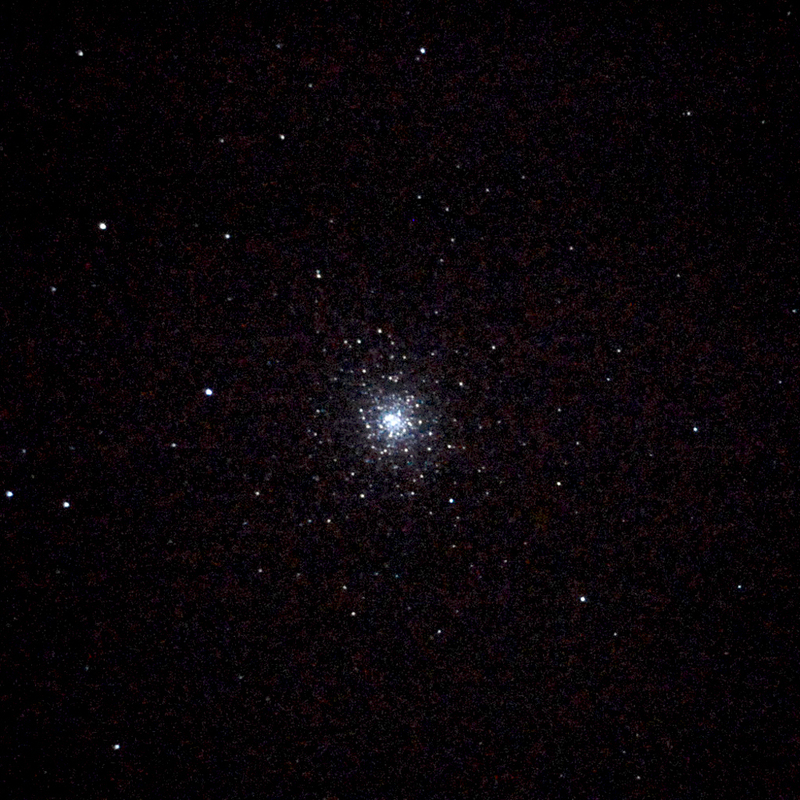 M92 is an example of a globular star cluster. This cluster is a collection of tens of thousands of stars clumped together forming a globe of pinpoints of light. 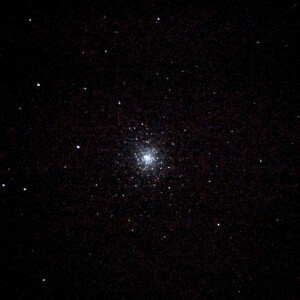 There are dozens of these clusters that can be viewed in the summer sky with a small telescope. 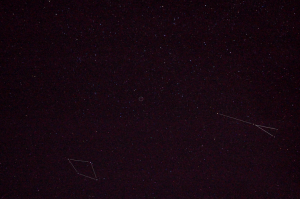 There are very few that you can see in the winter sky. The astronomer Harlo Shapley carefully plotted the direction and distance of these clusters, finding they made a sphere in the direction of the part of the Milky Way visible in the summer months – showing him the location of the center of the Milky Way Galaxy. Shapley was able to determine that our solar system is about 30,000 light years from the center of the Milky Way, two-thirds of the way from the center to the outer edge. Alberio, a blue and yellow star. The double star Alberio marks the head of Cygnus, the Swan. It is high in the sky after midnight. You will need a telescope to see the two stars side by side, they are too close together to be seen easily with hand held binoculars. Star colors are mostly a result of the temperature of the stars. 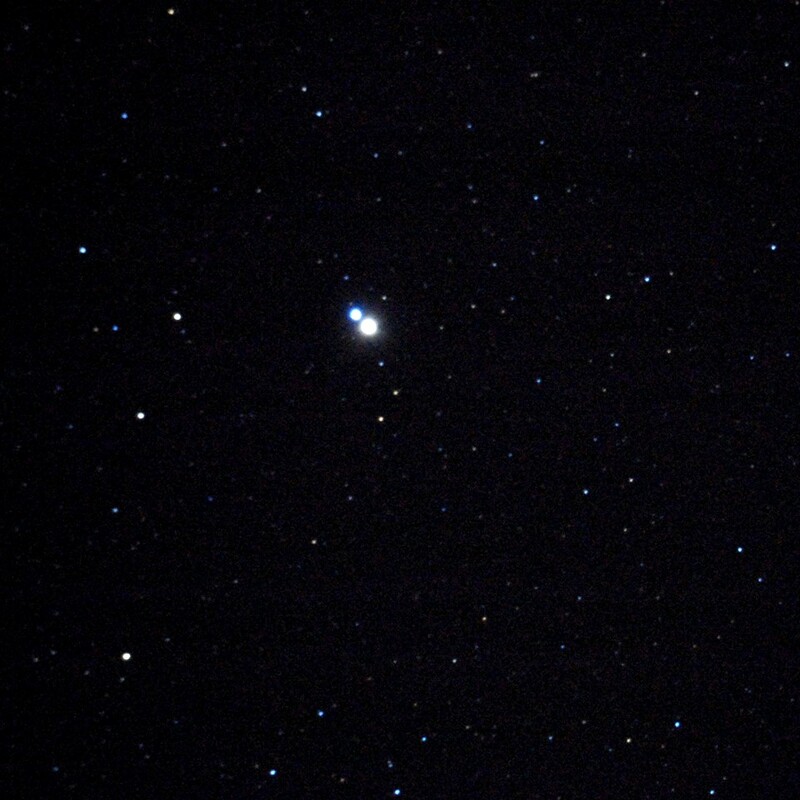 Cool stars are red to orange, intermediate stars are yellow, and hot stars are white to blue-white in color. The fainter star in this pair is a sapphire blue, but it is much hotter than its brighter, topaz colored companion. 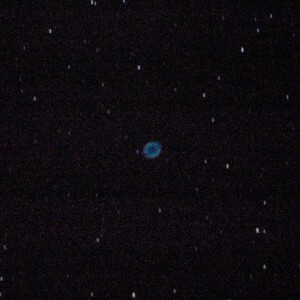 M57, the Ring Nebula, is a shell of gas surrounding a white dwarf star. The hot white dwarf star radiates ultraviolet light which excites the gases in the shell, causing them to glow in visible light. This image is very close to what a backyard astronomer sees as he looks through the eyepiece of his telescope. The nebula is located in the constellation Lyra, which is high overhead in the late hours of a summer night. 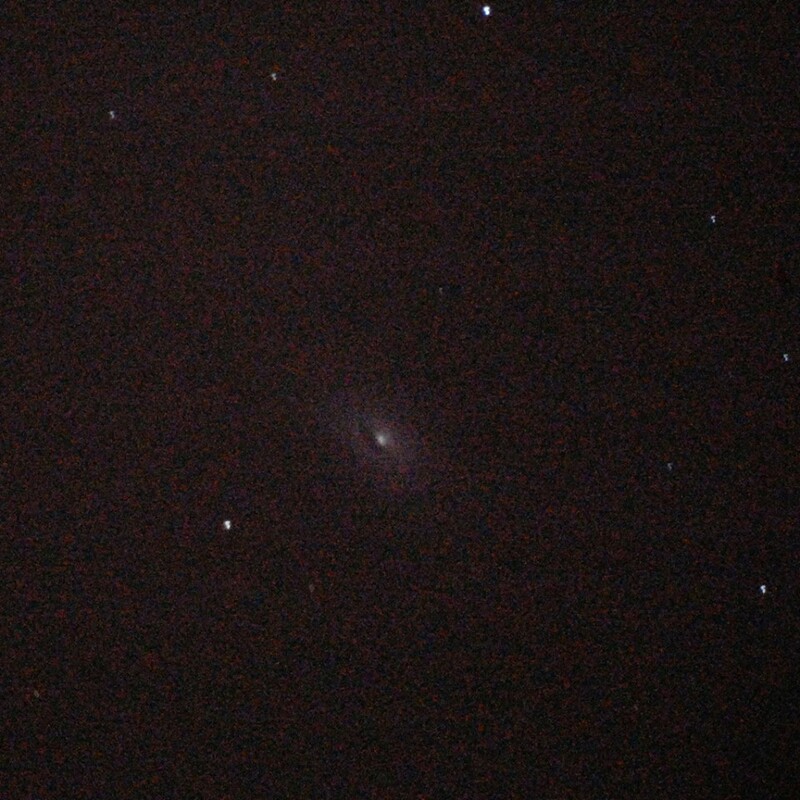 Finally got a galaxy other than M31 and the Milky Way! 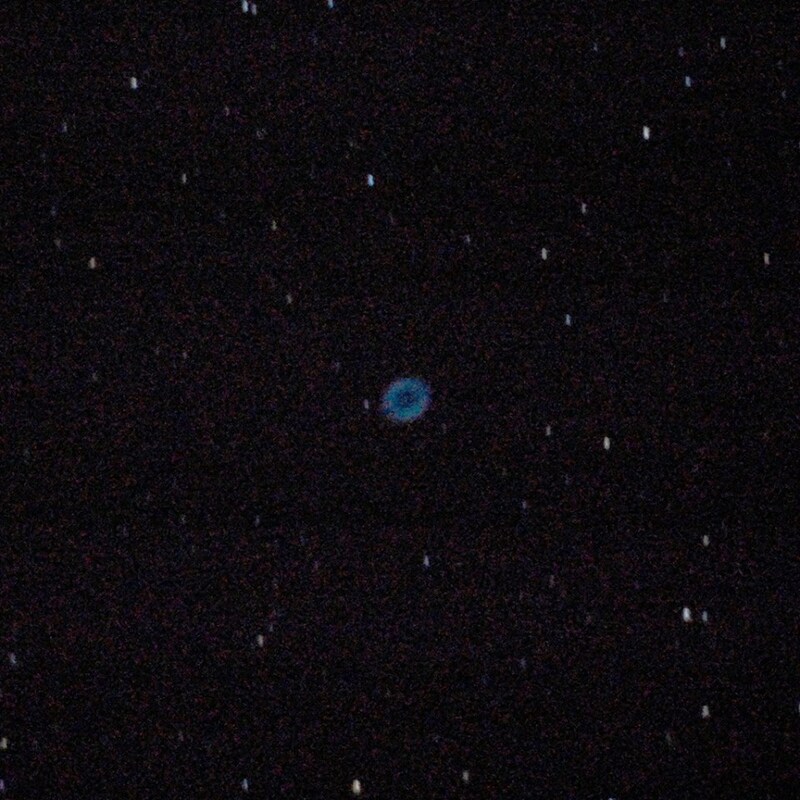 To get the object centered, I used the telescope setting circles. I set them on Arcturus, the brightest star in that area. 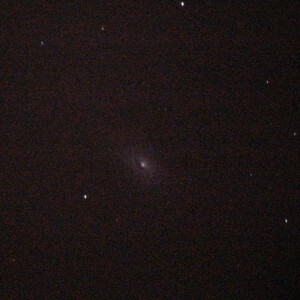 Then I moved the telescope to the catalog position and took a test exposure. The galaxy was in the upper right corner of the first frame, so I made a couple small tweaks with the control knobs to center the galaxy. I never saw the object through the telescope. This is a way I can continue practicing astronomy even though my glaucoma makes it difficult to look through the telescope. With more practice I will get even better. 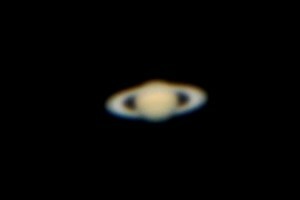 200mm f/10, 10mm eyepiece projection single image, 3 sec exposure @ ISO 800. There’s a hint of the Cassini gap in the rings at the sides. Getting a precise focus, a steady moment, and a good exposure only took about 50 tries. This morning the second astronomical event described in the planetarium show “Crossing the Sun” took place in clear skies. 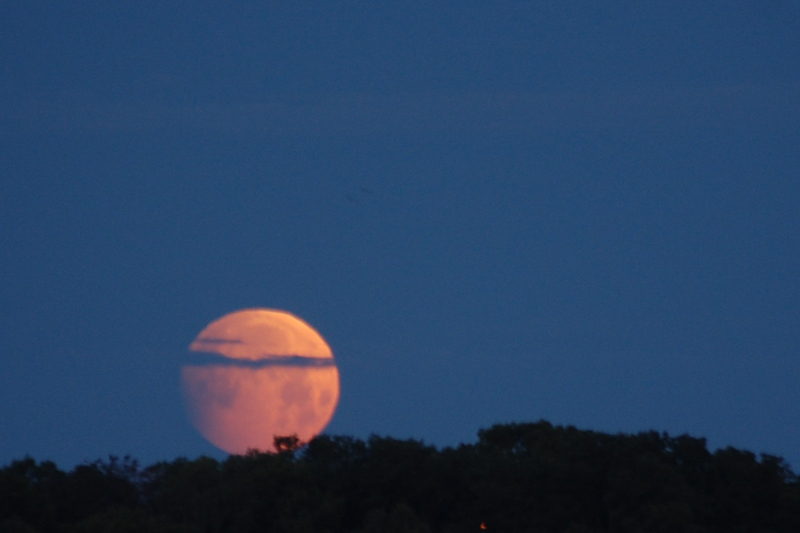 As the sun rose and the moon set on the opposite side of the sky, the Earth’s shadow began to slip across the moon making a partial lunar eclipse. Here in Kalamazoo it was not a spectacular event. Because of the timing of the event, the moon was sliding below the horizon just as the eclipse was becoming noticeable. But, as we said in the planetarium show, this is the warm up act for tomorrow evening’s Transit of Venus. We will begin our transit event with a free showing of the program “Crossing the Sun” followed by transit viewing with the museum’s telescopes. The show will start at 5:00 PM, and the telescopes will be ready to go at 6:00 PM – with the transit starting at approximately 6:05 PM. The next Transit of Venus is 105 years away, so come down to see this one. Skies are expected to be partly cloudy, but that means mostly clear! With the annular eclipse well behind me now, it is time to start preparing for next Tuesday’s Transit of Venus. This time I will be running a public program at the same time I am trying to photograph a time-lapse sequence of the event. My camera will be attached to the same telescope I used for the eclipse, but it will piggyback on my 200mm telescope which will have a foil filter for viewing. The camera image will be sent to the time-lapse computer, and the most recent image will be displayed on the screen for the audience to see the event as it happens. They will also be able to take turns peering through the 200mm telescope eyepiece for a “live” close-up view. I will step in from time to time to center the telescopes throughout the first hour of the transit. Polar alignment is scheduled between 5:50 and 5:55 PM EDT, when the sun has an azimuth of 270 degrees, with the transit starting about 10 minutes later. Museum Interpretation Specialists will keep three other telescopes aimed at the sun, projecting images for several people to view at the same time. Now, let’s hope for clear skies. After, it’s time to start thinking about Australia.